John Adams is a 2008 American television miniseries chronicling most of U.S. President John Adams‘s political life and his role in the founding of the United States. Paul Giamatti portrays John Adams. The miniseries was directed by Tom Hooper. Kirk Ellis wrote the screenplay based on the book John Adams by David McCullough. 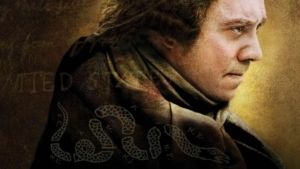 The biopic of John Adams and the story of the first 50 years of the United States was broadcast in seven parts by HBO between March 16 and April 20, 2008. John Adams received widespread critical acclaim and many prestigious awards. The show won four Golden Globe awards and 13 Emmy awards, more than any other miniseries in history.